Hello friends, Etisalat is currently giving out free 200MB worth of data to his customers. If you are an Android or iOS user, then be ready to enjoy your own free 200MB data. 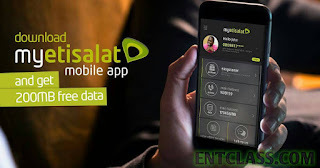 Etisalat is not just giving out the data just like that, you have to install and register on MyEtisalat mobile app. After you must have installed the app, register and activated your account, you will be rewarded with your free 200MB data. This is not a cheat, it is an official promo from Etisalat and a trick Etisalat is using to get you to install the app. According to the reviews by subscribers on Etisalat's official Facebook page, users has confirmed that they received their data after activating their account on MyEtisalat mobile app. Kindly note that if you install and register on the app on weekend days, i.e Saturday and Sunday, you won't receive the data until the next working day. HOW CAN I GET THE ETISALAT 200MB DATA REWARD? >> Download MyEtisalat Mobile App for Android Here or download it Here for iOS. >> Register on the app using your etisalat line, then you would receive your reward data from Etisalat. The reward data is valid for 24hours upon successful registration. In addition, all new and old subscribers are eligible for this offer. Have you received your free 200MB data from Etisalat? MyEtisalat 200MB free data. Download MyEtisalat mobile app apk for Android. MyEtisalat for iOS download. MyEtisalat free 200MB code. Dear Customer, you have been rewarded with 200MB data for downloading & using the new My Etisalat app. Thank you for choosing etisalat. Are you sure you are inputting an Etisalat number? .200mb valid for just one day??? Wetin I wan use 200mb do?